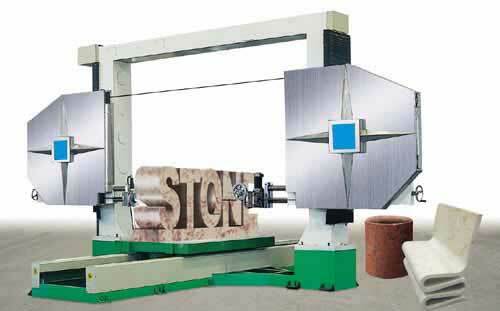 This machine is an automatic, contouring machine, designed for carrying out complex architectural shapes such as profile, column slab, Roman column and words on granite, marble and every kind if natural stone. CNC control and Windows98 interface make every preliminary and final operation simplified. It is able to be operated by telephone network in long range. The geometrical frame guarantees of absence of vibrations and an increasing of the wear resistance during time. This Wire Cutting Machine is an automatic, contouring machine, designed for carrying out complex architectural shapes or processing new-shaped of granite and marble, cutting different sized and thickness, such as profile, column slab, Roman column and words on granite or marble and every kind of natural stone. Wire Cutting Machine features of solid structure, fast cutting, less power consumption, high capability, stable performance and low failure rate. Adopting overseas advanced technology, such as CNC control and Windows98 interface, make Wire Saw Machine every preliminary and final operation simplified. Our experience of making Wire Saw Machine allowed us to develop it to reach its construction quality, technical features and use of selected materials. Diamond Wire Saw is able to be operated by telephone network in long range and is applicable for wire cutting with high efficiency. During running, Diamond Wire Saw does not make any noise, and install underground screws not required. The geometrical frame of Wire Cutting Machine guarantees absence of vibrations and an increasing of the wear resistance during time. With frequency control, the Wire Cutting Machine runs steadily and has less risks of damage. Yuxiang is a specialized Manufacturer , Supplier of Granite & Marble cutting equipment, including Wire Cutting Machine, Wire Saw Machine, Diamond Wire Saw, multi-wire saw, granite column slab, Roman column, cutting granite saw, cutting granite machine, cutting edge granite, granite cutting board.